Say hello to the only cookie you’ll ever need. These really are my new favorite cookie. And, by new, I mean an old favorite (that’s been veganized)! 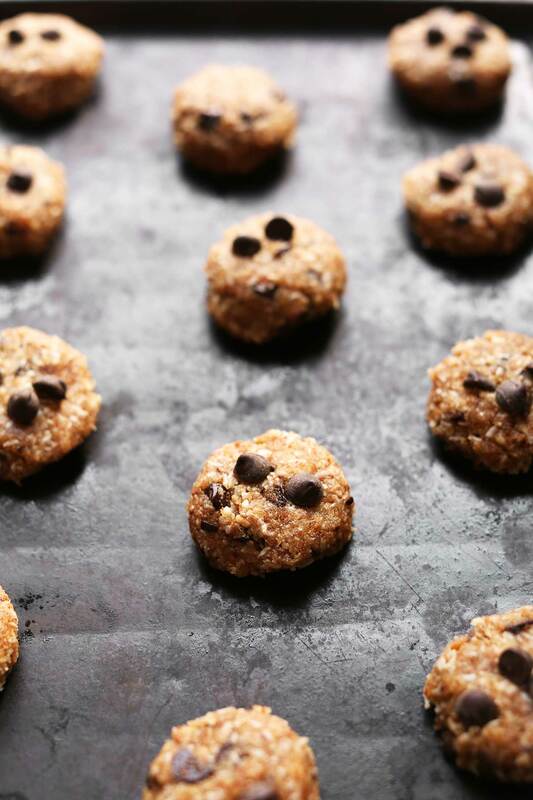 If you’ve tried these Almond Meal Cookies with Coconut and Chocolate Chips, you already know how amazing they are. However, the recipe does require an egg, and a reader recently suggested/asked if I had tried veganizing them. Brilliant idea, reader. Thank you! Because I’m always testing new recipes, I rarely reach back and remake old ones. But this called for a special retest! Onto the show. This recipe is simple, requiring just 9 ingredients and roughly 1 hour (including chilling)! After the dough has been mixed and chilled for 30 minutes, scoop, bake for 12-15 minutes, and BAM. You have chocolate chip cookie perfection. If you try this recipe, let us know! Leave a comment, rate it, and don’t forget to tag a photo #minimalistbaker on Instagram! We’d love to see what you bake up. Cheers, friends! The best almond meal cookies made with 9 ingredients! Crispy on the outside, chewy on the inside, super chocolaty! A delicious vegan, gluten-free dessert! 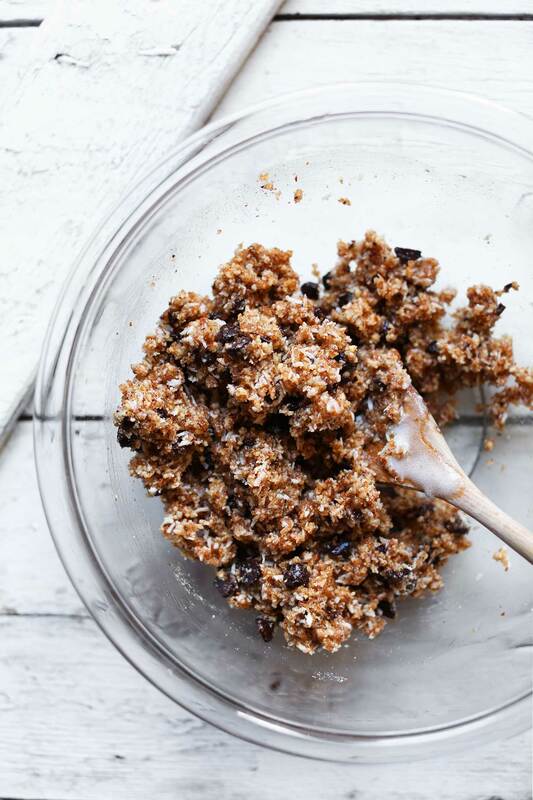 In a large mixing bowl, stir together almond meal, dark chocolate chips, coconut, baking powder, salt, and sugar. To the aquafaba, add the melted coconut oil and vanilla and beat or whisk to combine. Then add to dry ingredients and mix until just combined. You should have a firm, semi-tacky dough (see photo). Preheat oven to 375 degrees F (190 C). Scoop out 1 /1/2-Tablespoon amounts of dough (I like this scoop) and form into small discs (see photo). Place on a bare or parchment-lined baking sheet with about a 1-inch gap in between each cookie to allow for spreading. There should be about 12 cookies (amount as original recipe is written // adjust if altering batch size). Remove from oven and let cool for 5-10 minutes. Then carefully loosen with a spatula - they can stick a little to the bare pan. Enjoy immediately or let cool. Store leftovers in a sealed container at room temperature up to 4 days or 1 month in the freezer. These are insanely delicious when warm and dipped in almond milk or hot cocoa! 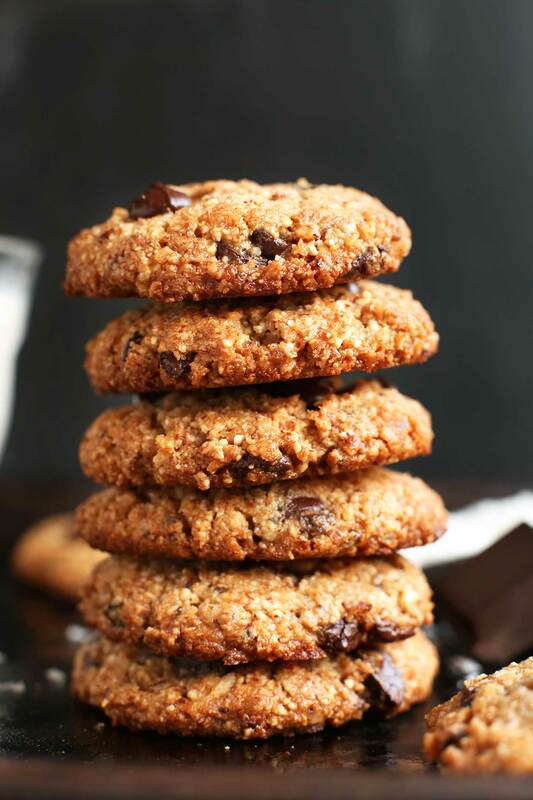 *Recipe closely adapted from these Almond Meal Cookies with Coconut and Chocolate Chips (which are from the Sprouted Kitchen Cookbook). PS We follow you regularly and make quite a few of your recipes. You are my first go to when I want something vegan. 💖 Thank you. These are wonderful. I’ve made them so many times, and I have yet to meet a person that doesn’t think that they are great. I made them for my family the last time that they visited, and now it is everyone’s go to cookie recipe. I usually halve the sugar, and they are still delicious. Thanks for such a great recipe! These are fabulous cookies! And although it was my first attempt at using aquafaba and I am one happy convert :-) My husband just admitted that he wasn’t able to resist having a third cookie as he put the rest of the fresh batch in storage. I’ll be baking these us again soon. Thank you for your amazing recipes and food photos! Flavor is extraordinary. Consistency was nice. Moist and crispy. Works great with coconut sugar. Next time I make them I would like to form them to the pan better. Mine stayed very much disk like and not the whole bottoms got that cripsy brown deliciousness. I can’t have almonds and several other nuts, but I can have peanuts. What do you suggest to replace the almond flour/almond meal? Hi Gabrielle! Another reader successfully substituted the almond flour for Bob’s gluten free all purpose baking flour, which you may want to try! This is my first time using aquafaba. Thank you for you dedication to healthy, delicious food! Now that I have this all mixed together, I’m confused about the stage of aquafaba that is listed as 1/4 cup. Is that in brine form (so put in all whipped aquafaba) or only put in 1/4 cup of whipped aquafaba? Thank you! I have made these cookies a million times and they are by far my favorite chocolate chip cookies ever ! This is so easy to make with kids too. I often make these when my daughter has friends over for play dates, and they LOVE baking with me. Thank you ! These are my favorite cookie to make, eat, and share! I’m currently trying to cut out sugar. Is it possible to sub date paste or maple syrup for brown sugar? And what would be tbe ratio of so? This is the first time I’ve ever really tried gluten free or vegan baking. I’ve made a few things here and there, but nothing to replace a traditional food. My expectations were low, but I was very pleasantly surprised. They don’t taste exactly like regular chocolate chip cookies (they have a very slight grittiness and nutty taste) but they were very good! I can’t attest to how these compare to other GF/vegan recipes, but I plan to make them again. The first time I tried to whip the aquafaba, it went everywhere! I definitely recommend starting on the lowest setting. I gradually worked my way up and had to finally use the highest speed to get it to really fluff up, but after at least 5, if not 10, minutes, it really did fluff up nicely. (And I didn’t have cream of tartar to use.) I at least doubled the chocolate chips and I used half the amount of salt. (I wasn’t sure if I was supposed to use chickpeas with salt added, and that’s all I had.) My cookie scooper is 1 tbs, so I would up making 23. They still took 13 minutes to bake, so I imagine I would have had to bake the full sized version longer. My dad can’t have gluten and my sister can’t have eggs or gluten, so I’m thrilled to bring these to family Christmas. Thanks for the great recipe! When you say you used ‘half almond flour’….does that mean that out of the 1 1/4 of almond meal, half of that almond meal is almond flour? Half of 1 1/4 cup is 1/2 cup + 2 tbsp. So does this mean to have 1/2 cup + 2 tbsp of almond meal and 1/2 cup + 2 tbsp of almond flour? I want to include the almond flour with the almond meal to make the cookies fluffier. But I am not sure what that ingredient description means. This recipe looks like a winner. I’m curious about the sugar content. The only change from the original recipe appears to be swapping out aquafaba for the egg, yet the sugar content doubled. I’m happy to make these with egg if it’ll cut the sugar in half. Is it the protein in the egg that cuts the sugar? Any insight will be appreciated. Thank you so much. Love, love, love your website. Hi! Ive never used the aquafaba, in fact have never even heard of it(maybe because Im not vegan lol) Can you substitute anything for it & does it make the cookie taste different or is does it not have flavor? Hi Lisa! You can find out more about aquafaba here! It does not have much flavor! I’ve eaten quite a few myself but I’ve also fed them to family and friends, all of whom are big fans. Wow so good. THANK YOU FOR BRINGING THESE COOKIES INTO MY LIFE. Yay! We are glad you love them, Lilly! I am addicted to these!! Have made it so many times, I also add one scoop of protein powder to it. I just made these cookies for the first time and they’re delicious. However, they don’t stay as a cookie, they crumble and I have to eat them with the spoon. I don’t mind as I said they’re delicious. But I wanted to pack them in my daughters lunch, Oh well. And when I whipped up the aqua fava it look like a meringue until I added the vanilla and coconut oil. Then it lost all its air. I tried to pop it up again but to no avail. Would this be why cookies didn’t pull together?. Hi JC! The aquafaba deflating is normal, but these shouldn’t be crumbly. Not sure what went wrong there, but did you not refrigerate the batter before scooping and baking? Hi! Check the comments above for using flax eggs as other readers have had success with it! can i substitute coconut sugar instead of brown? Oh my gosh, are these good?! I have made them several times and they’re pretty fool proof – even when I don’t follow things exactly and just eyeball measurements they come out great. My butter and milk and meat eating husband told me these are the best cookies he has ever had. And he’s super picky so that says a lot! Today I threw in about 1/3 cup rolled oats and I think I like them even better that way. They had a hearty and chewy texture. I agree with you, these are the best GF cookies i’ve ever tasted! I made hummus and with the chickpeas canned liquid I made acuafaba to double dough!thank you for sharing! Absolute delicious! Hi, Thank you for all the delicious recipes I’ve enjoyed over the years!! Can I substitute aquafaba for flaxseed eggs? Does the aquafaba temperature matter? I have some liquid that’s sitting in the fridge so I’m not sure if it will make a stiff consistency? Aquafaba from the fridge will work! Home today with a sick toddler, fighting the urge to eat the unhealthy cookies I made this past weekend with my mom for Christmas. Just happened to come across your recipe this morning and had all the ingredients on hand to make this less guilty cookie ? I substituted a flax egg but besides that did everything according to recipe and these are so delicious! Slightly crisp on the outside, soft on the inside. Now onto making your vegan barbacoa for dinner (one of my absolute favorites!). Thank you! I’m so grateful for all the amazing tasting yet healthy recipes you share with us. I just made these cookies and they turned out perfect! I used almond flour instead of almond meal, honestly I don’t even know the difference between the flour and meal. Outstanding! Was totally craving cookies and typed “oatmeal chocolate chip” into Google. Happily, this came up and sounded perfect. Followed directions pretty closely. Only exception – didn’t have vanilla so subbed almond extract. Just fantastic and quite easy. Thank you, Dana!!! The taste is amazing but these came out as the most crumbly cookies ever for me! Reading other reviews only few people had this problem.. are there any suggestions on preventing the crumble? I feel it has something to do with the aquafaba but I followed the instructions carefully. Would using an egg instead help with binding? Hi Sam! It shouldn’t be crumbly, you could try and egg if you aren’t vegan next time! I made these today. Delish! Mine came out flatter. I put too much baking powder. Thought they would be puffier. I am new to vegan baking. Loving the aquafaba! Would like to make these again with no shreaded coconut. It overpowers the cookie. Great recipe! YUM! I just made these today. They’re more like macaroons than cookies. Which is fine if you love and wanted macaroons, not so much if you were after real cookies though. And I found them a tad too sweet for my taste. I used coconut sugar and it worked fine but I’d recommend using less than the specified amount if you don’t like very sugary sweets. Hi! We haven’t tried it, but let us know how it turns out if you do! ok so I make these cookies allll the time ….these are truly the only cookie I will ever need. The cookies are freakin amazing!!!!!! Everytime I make them for people they rave about them. I cannot tell you how many people I have forwarded this recipe to. I have also recently become plant based and have experiemented with many of your other recipes. Love every one !!! Thank you !!!! I already whipped up a huge batch of aquafaba and am looking for ways to use it. How many cups of WHIPPED aquafaba are in this recipe? (As in, how much does the 1/4 cup become once whipped?) Thanks! I made these for something to do, but ended up eating them so uncontrollably I just skipped dinner altogether last night. They are SO GOOD, genius. I used all almond flour, subbed coconut oil for earth balance vegan butter and the coconut for oats and I’m not sorry. Some peopled mentioned burning on the bottom, but usually that is avoided with a good pan. Just to be on the safe side, I baked at 350 for 12 min and then turned up the heat to 375 for 2 for more of a golden color and they came out absolutely perfect. Perhaps it’s better to add the coconut oil to the dough first and then the beaten aquafaba, because my aquafaba lost ist forthy-ness when whisked with coconut oil ? I second that. Adding the oil to the dry ingredients first would be best to avoid the aquafaba reverting to its liquid state. Delicious is an understatement! These are our new favorite cookies. We used eggs instead of the aquafaba, and they turned out great! Made these on the weekend when I needed a little something on the fly to bring to a casual event. I did not have aquafaba on hand (but can’t wait to try that too) so I subbed in a flax egg. They were a huge hit! 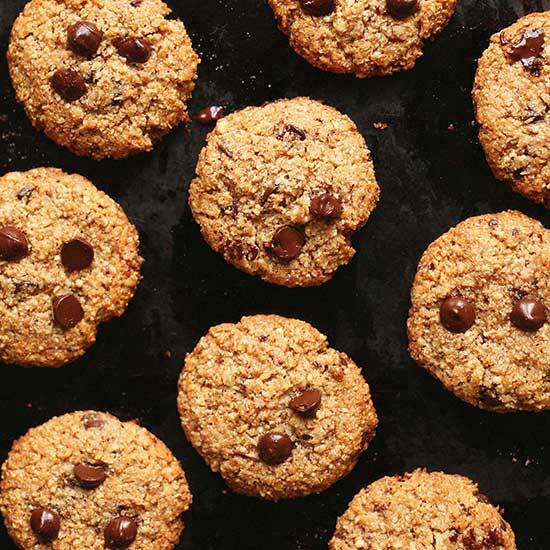 The texture is very much like a nice chewy macaroon and with the organic, dark chocolate chips (and added mini m and m candies to please the wee folk) they had the comforting flavour of homemade chocolate chip cookies that store bought can’t touch! 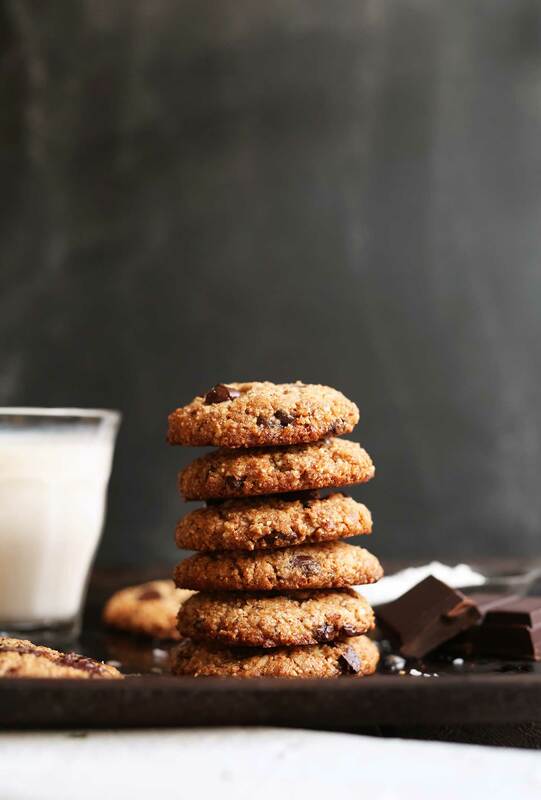 Best Almond Meal Chocolate chip cookies are the absolute best ever chocolate chip cookie this recipe is a fantastic new twist to the historic cookie !!!! Great Work!!!!!! Well these are amazing! I’ve just made my second batch this week…. They were a hit for my gluten and lactose free friends! Thank youuuuuu! Did you grind the almonds yourself to give you the almond meal? I am keen to grind the almonds myself to give me the almond meal. What qty of raw almonds would I need to grind to get 1 1/4 cup almond meal? My blendtec book said 1 cup of almonds equals about 1 1/4 meal. Can I sub the almond meal for ground oats? I think that would work Sam! But you may need to add more liquid if they seem dry. Report back on how it goes! I opened a can of chickpeas to make a salad for lunch and so decided to make cookies with the aquafaba. Just made these cookies – so good! I subsititued some almonds for gluten free oats, and I used 50:50 of xylitol and honey instead of sugar. Didn’t come out looking amazing as I cooked them too long hehe but taste yuuuum! I found that although the aquafaba breast up nicely into soft peaks, when I added the melted coconut oil and vanilla, it went flat at once. I had to mix it in at that point as i couldn’t waste it. How do you avoid it falling flat when you add that to the aquafaba? It also separated as the coconut oil cooled. 2. I doing the mix was too dry, couldn’t really gather it together and it certainly wasn’t almost tacky. I added a couple of tablespoons of nut milk yogurt which made it a little better. Do you have any idea why it was dry? Really great cookies and are filling! I also love how simple they were to make! Yum! Double happening tonight!! Thank you for your wonderful recipes! We whipped the aquafaba and then mixed in the melted coconut oil with a hand mixer and it immediately collapsed. Ive had similar experiences with other dessert recipes that call for melted coconut oil – how do you keep it from solidifying? Thank you! Hi Yoko! It will collapse a little – that’s OK! But it certainly should not solidify. Hi ?Can I use something else insisted of aquafaba? The can of beans is pretty expensive here. ? Hi! How about a flax egg? I just baked these cookies, they are absolutely delicious. I told my husband that I made some gf cookies he broke one in half and after the first bite he said never mind I want the whole cookie it’s so good! Great recipe, I will make it again and again…. Thank you for sharing it! Hi. Thank you for sharing this recipe. I could not find almond meal in the stores. They do have almond flour. Can the almond meal be omitted? Hi Carol! Check the other comments as others experimented with this! Good luck! I love these cookies. I’ve made them at least a half dozen times and I’ve made them with almond flour instead of meal and they turn out great! I think that the key is a longer refrigerator session- at least 4 hours. It allows the vanilla to permeate the dough and makes it so great! Thanks so much for your recipes- this is my go-to website! (I made 1 pot red lentil chili and perfect vegan cornbread for dinner tonight too). I think I added too much Aquafaba because they were super sticky and wet, which caused them to cook weird. The bottom burnt a bit but the inside wasn’t cooked. I still ate them because the flavor is OUT OF THIS WORLD and since they weren’t super cooked inside, they were super chewy. I can’t wait to make these again and put the correct amount of Aquafaba. I also used coconut sugar instead of brown and it is just so so good. Thank you for this amazing recipe! The skies looked grey and gloomy today (as always, it’s Seattle :/ ) so I decided to make these to cheer myself up. My god, Dana,these are SO good. They somehow remind me of an Indian sweet (because of the coconut). Very creative. Smell SO good. I just can’t get them to be completely solid. They are slightly gooey and also stick to my baking pan. Could you give any suggestions? I don’t want to leave them in the oven longer since the bottom seemed to have browned to almost black, and I don’t want the fire alarm going off (it’s super annoying). Aw, man, Dana! I made these this afternoon, and have eaten three already! I don’t know how you keep doing it, but these are pretty dang amazing! Thanks for your straight forward, consistently awesome recipes. Yum, Yum! turned out perfect. 14-year old daughter gave it her approval. This recipe is going into the ‘keeper’ section. Love this site, great recipes that are healthy and don’t overwhelm me. Thank you. These are the best cookies ever!!! Thank you for turning me on to Aquafaba! Hi Dana! I just made them and they turned out delicious: incredible taste and perfect texture. Just to let you and nut-allergic people know, I successfully used finely ground sunflower seeds instead of almond flour/meal :) Definitely baking them soon again! This makes me want to bake so badly! A bit late though haha!! Looks so yummy, maybe the weekend i can make these! These are AMAZING. My fiance informed me the other day they are his favorite cookies. (I’ve been making them weekly since I first discovered this recipe a couple weeks ago) I usually double the batch (we go through them quite quickly), but I made a mistake with the amount of almond flour I put in (1 1/2 cups instead of 2 1/2 for a doubled recipe) and it baked into this thin crispy toffee like cookie. Which is even more amazing! I made these with my son. We both love them! As always your recipes are the best. I’ve made alot. Even minimise the minimalist ?for the our pastry class for my son and his friends. The auafaba is equivalent to how many eggs (want to use flaxseed instead). Making it for the little ones. I substituted with 1 egg. Yummm! Wow these cookies look so good! I can’t wait to try this recipe. By the way: I love the design of this blog! It is always a pleasure to “come by”. I have made these now about 5 times and my family and I are in love with them. So easy to make. I find it best to double the recipe and then that is the right amount of aquafaba. Otherwise I end up with too many garbanzo beans to use up!!! The dough lasts quite a while in the refrigerator (if people aren’t snacking on it all the time as they do). I cook up in smaller batches so we have fresh baked cookies almost daily. I love that these are not so doughy as some other cookies are. I use whole raw almonds and put them in my vitamix and I do not use almond flour at all and I love how they turn out. I am obsessed with your website and have loved all the recipes I have tried thus far. Your tastes are so in line with what I love so I am so glad my friend told me about your site. I have shared with many of my friends now. Thanks for all the great recipes. I just made this recipe and it’s absolutely delicious! I used almond flour only because i didn’t have the almond meal and they came out great! Crunchy and a little bit chewy! They were a little pale buts very tasty! Thank you for so many amazing recipes! I’m a huge fan, love your book! Lots of love from Puerto Rico! I just made this yesterday and they were delicious!!!! Thanks Dana! These cookies are delicious! Thank you so much for sharing the recipe and for having such detailed instructions. I was wondering how you got your cookies to be golden and shiny on the top? My cookies tasted great but looked dull and dry on the top (despite being moist on the inside). They have a great consistency, so I don’t think I over baked them. Also, the bottoms turned out great (if not a little too dark) so I don’t think I should leave them in any longer. I tried brushing a little coconut oil on the cookie tops in the middle of baking to add some color and shine but it didn’t work. Any advise on how to get the look of these cookies to be more golden and shiny on the top would be so appreciated! Hi Sophia! I think the shininess comes from a moist dough, so make sure your aquafaba and oil are in the right quantity to make a tacky dough! Add more if it looks dry. And to make sure they don’t get too browned on the bottom you can try turning down your oven temp a little next time. Good luck! Sooooo good! I love your recipes. Thank you for sharing! 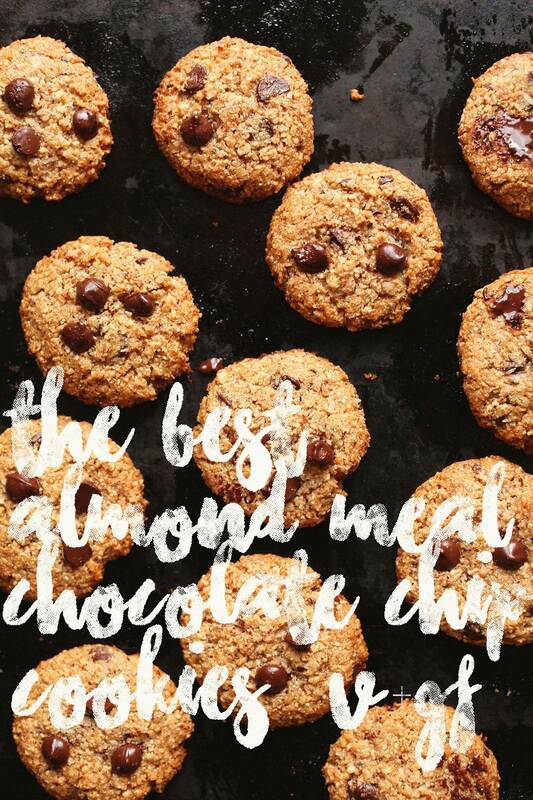 This recipe is really THE BEST ALMOND MEAL CHOCOLATE CHIP COOKIES!!!!! COCONUT SUGAR instead of brown sugar, and it’s AMAZING!!!!!!! I will totally make these again!! <3 thank you! I made these tonight and they smell amazing coming out of the oven. I didn’t have any almond flour, so I used 3/4 cup almond meal and 1/2 cup of whole wheat pastry flour. I used a large egg instead of aquafaba. Otherwise, I followed the recipe very closely. The dough looked kind of dry initially and was still a little dry after chilling. They didn’t hold together well either while I was forming them and most fell apart in the oven. I have some delicious cookie brittle to eat now, but these look so amazing that I would love to try them again. How can I troubleshoot this? Thanks!! Hi Cathy! It sounds like maybe you were lacking in moisture! Make sure your egg white is from a large egg so you have enough. The dough should feel tacky by the time it goes in the fridge (see photo). Not sure how the flour affected these – perhaps that was another issue. Good luck next time! I ate 5 straight out of the oven. Oh my goodness, delicious. I can’t make these too often or I’ll just get fat. Also, my first time using aquafaba – it’s bloody brilliant! Thank you Dana, another great recipe. Hi! Maybe apple sauce? I can’t guarantee the results as I have not tried it though. Check back if you do! I made these cookies yesterday. First of all, you can’t tell it is gluten free. Second of all, these are probably the easiest, guilt-free, and best tasting cookies ever! Definitely will make this again. Yay! Thanks for sharing, Urvashi! OM goodness! These are amazing. Thank you, Dana. I love them. I definitely making these for my friends. It is really amazing. Hi! Love your recipes. I just saw a note in the latest cooks illustrated about using cooking liquid from cooking dried beans. They have that is about 1/2 cup cooking liquid in a can of beans which you can save after you cook your own and then add 1/2 teaspoon of corn starch to get that viscuous texture. Then freeze for later use like in these delicious cookies! Cheers! We make our own hazelnut milk and so have a TON of hazelnut meal hanging around. How do you think that would do in these cookies? I should clarify that we dry it out and grind it further so it’s a legit meal, no longer pulp ~ I’m mostly concerned about the taste difference between almond and hazelnut. Sometimes it can be a bit bitter. Hi Sarah! I think that should work – it should actually be delicious! We can’t use any type of sugar. Has anyone tried using stevia? How did it work? Also, can we use egg yolks? My son can’t have the whites, but has the yolks. Thanks! Hi Joyce! Egg yolks should work? Not sure though. And if subbing stevia I’d suggest adding more dry ingredients to compensate for its absence. Good luck! I used Unblanched Almond Flour/Meal for this recipe. I use it to make your delicious pumpkin bread recipe which has become a staple in our house. These cookies browned underneath but not on top and were crumbly (did not hold together). Do you have any suggestions to bring them closer to yours? Oh, and should the melted coconut oil be cooled prior to adding to the aquafaba? Thanking you in advance. Hi Anneke! If they were crumbly I’d say you needed more aquafaba and/or oil. And if yours browned too quickly on the bottom perhaps try lowering your oven temperature next time! You don’t have to cool the melted coconut oil – good question! I had similar results I followed the recipe exactly, but my cookies became totally flat and crispy and got really brown on the edges. YUMMM!!! I love the originals, so I will surely love these too! Love chocolate, just not a chic-chip cookie person so I always sub raisins:) Maybe they aren’t a true monster cookie anymore, but still super delish!! could i just grind up almonds to make almond meal? or is it best to use store bought almond meal? I actually grind mine at home! Both will work. Hi! You can make your own if you prefer! Hi Marissa! I’m guessing it was the flax egg. It doesn’t provide the same volume / tackiness as the aquafaba. Hopefully you can use it next time! What can you use the chick peas for after draining liquid? Also can you dbl or triple recipe? Double & triple away! Here are a couple of our favorite recipes which you could use the leftover chickpeas for! Here, here & here! These look amazing! Can”t wait to give them a try! One question- would it work to substitute coconut sugar for the brown sugar? I am excited to try this recipe! I have never made Aquafaba before! I saw you recommended a handheld mixer. Do you think a kitchen aid bowl mixer would work as well? Hi! It will work but we preferred a handheld mixer! Good luck! I LOVE LOVE LOVE all your recipes and they are always a hit around here!! Thank you so much for this awesome blog! Out of curiosity — what does the aquafaba do? Aurora – gorgeous name btw :D Aquafaba serves as the egg / binder in this recipe and helps the cookies fluff up! Good luck! You can also use flax eggs, another reader suggested. Or if not vegan, use eggs as the original (linked) recipe suggests. Thank you so much! Have two kiddos allergic to eggs! Is it possible to send you a picture I have, taken right after I got your newest book? I made these cookies as an experiment for my whole family (including the Austrians and Italians) during Christmas. In a test out of 4 other kinds – this one was the absolute favourite. No one even thought twice about a “vegan” wheat-free cookie because it was so freakin’ delicious. And it out-shown the traditional cookies on the plate. I timed a batch – gone in less than 2 minutes (10 people). It’s now a regular addition to “treats”. Thank you for this!! Yay! Thanks for sharing, Susanne! You can get chickpeas in glass jars – so not sure this is a problem. But I’m living in Europe, so the standards are different perhaps. Hi Randi! Definitely use homemade aquafaba if you’re concerned! Is there a ratio for cooking you suggest of water to chick peas when making your own Aquafaba? No one needs to buy canned chick peas when they are so easy to buy dried (in bulk), soak and cook, then freeze. The cooking liquid is aquafaba. I guess anyone who knows or cares about BPA already is doing their own. Many people simply don’t care. I buy package free chickpeas (from bulk stores), store them in a glass jar, and use the brine from cooking those to make aquafaba. So it is possible to do without BPA. Apple sauce as an oil substitute? Thanks for a recipe that suggests using aquafaba. I knew you could reuse the liquid but never have anything I feel like making with it. Now I do. For people who cook dry chickpeas, you can also use the cooking liquid (but not the soaking liquid). Thanks also for the chia seed pudding and gado gado recipes. I am a new subscriber and these recipes add a bit of variety to my diet and also give me a good source of simple vegan recipes that I (being omnivore) can make for my vegan friends. Often vegan recipes require fancy ingredients I don’t have in my pantry, but I find that with yours, I always have everything on hand)! Would it work to use leftover almond pulp from making almond milk?? I’m desperately trying to find more ways to use up the pulp! Hi! I think that the pulp may be too pulpy for this recipe. If you give it a try though, let me know how it goes! I’ve tried with almond pulp, and this is really good! Very moist and tasty, I love it! My non-vegan colleagues do too haha. Thanks for the recipe, that’s a keeper! I did exactly the same thing… Feels a bit watery in the inside but apart from that they’re delicious… Don’t know what the texture should be like… Could anyone tell how did their’s pan out ? Home made Aquafa doesn’t work? I try to not use canned food. Holy gracious these look amazing! And an answer to my almond meal/flour cookie prayers! Have you tried the same recipe but with chia or flax eggs as the egg replacer? I’m totally down for some aquafaba action, but I’m just curious about the alternative(s)! Yes! Another reader said flax eggs work! Good luck. These look awesome!! Would I be able to substitute olive oil for the coconut oil in the recipe? Hi! Olive oil should work! Good luck! Any substitutes for brown sugar?? I would like to know that too. Can honey be used? Hi! Honey should work but you may want to reduce the amount! Good luck! In place of brown sugar you could probably use coconut sugar, or definitely muscovado. Know that if you’re subbing a wet sweetener – like honey or maple syrup – you’ll need to adjust the amount of dry ingredients as the batter will likely be more wet. I used date sugar and the cookies turned out to be still excellent! Does anyone know if you can freeze aquafaba for future use? Love all the recipes! So many allergies in the family, I always look to your recipes first! Hi! If you don’t want to use all the aquafaba at once, you can freeze it! Pour into an ice cube tray and once completely frozen decant into a glass storage container and keep in the freezer. Good luck! I printed this recipe to add to my binder and to try when next we bake Chocolate chips cookies but we will not use coconut; don’t like it. I am still waiting for the cookbook request that I put on hold at library. I look forward to collecting and trying more of the minimalist recipes and thank you for sharing. These look amazing! Has anyone tried them without the coconut or using a substitute for it? My husband is not a fan of coconut. And yes, Dana, you DO rock! Thanks for all you do. Hi Sandy! See my comment above, but I do think you could try using all almond meal or even oats. Good luck! These look delicious! Quick question about aquafaba. I’m trying to get a lot more minimalist in the kitchen and have stopped purchasing canned beans in favor of dried beans from the bulk bin. I think this is much better for the environment. However, I’m not sure if the leftover liquid from home-cooked chickpeas is the same as from canned. Can “homemade” aquafaba be used in recipes? Thanks so much, Dana! Hi Liz! Homemade aquafaba can indeed be used! Happy cooking! Great, thanks so much Dana! Great that’s exactly what I wanted to know too. Can’t wait to try these. Can all almond flour be used as opposed to almond meal and the flour? Thanks!!! Love all your recipes!! ? Hi! Almond flour lends itself well to cookies, treats and baked goods that are best when fluffy. Almond meal is best suited for recipes that call for less than 1/2 cup of almond flour due to its overall heaviness. I would recommend doing half and half but if you want to try using all almond flour, that should work. If you try it out, let me know how it goes! I used all almond meal and it was very heavy and crumbly and didn’t look as pretty. Next time I’ll stick with what the pro says! Still quite a delicious little cookie! I have made these cookies by another vegan blogger but she uses veg oil, so I know how insanely good they are. Can’t wait to sub the oil for bean liquid now! Thank you so much for your recipe Dana, you ROCK! I love your recipes and I’m now ready to try Aquafaba. I live in Portland, OR, where do you buy it locally? Hi! Unsalted is definitely your best bet! THESE ARE MY FAVORITE COOKIES EVER. I honestly had to make myself stop making them because it was becoming a weekly thing. Also, I’ve always made with a flax egg (because lazy) and had good results. Thanks for sharing, Ms. Butters! Your feedback is valuable. Hiiii so did you subtitute the aquafaba to flax egg? Is there anything I could substitute for the coconut? Hi Tala! You could try using all almond meal, or maybe oats? But it will definitely affect the flavor/texture, so adjust accordingly. Let us know if you give it a try! I used oat flour instead of almond meal and they were still delicious! You may just want to add a little more liquid (either coconut oil or almond milk) to the mix as the oats make it a little drier. OMG I must try it soon! The cookies look divine! Okay, I need to get in on this aquafaba business because these look freaking amazing. I’ve never seen a vegan cookie look so golden. Come to mama! Hi, cookies looks so delicious. Can aquafaba (the brine / liquid in a can of chickpea) to change the usual egg or egg substitute? Thank you. Hi Kristine! I’m not sure I understand your question…if you’re looking to use eggs, refer to the original recipe linked in the notes! I dont see it. Can I use eggs instead? How many?